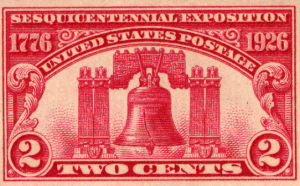 ¶ 2 Leave a comment on paragraph 2 0 Commemorations of persevering pilgrims figuratively gave birth to Revolutionary War heroes who fought for freedom against British oppressors as represented in stamps. 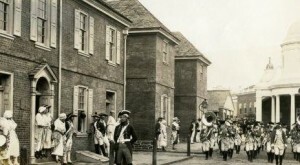 Starting in 1925, a flurry of activity surrounded the 150th anniversary of the American Revolution that included many regional and local celebrations held across the United States. Following the lead of the pilgrim anniversaries, local committees petitioned their legislators seeking commemorative stamps and coins to recognize regionally-significant battles and heroes. The House Committee on Coinage, Weights, and Measures grew tired of such requests for commemorative coins. 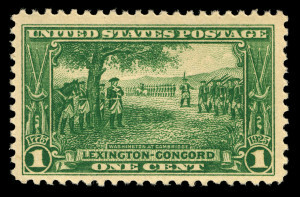 Responding to a request for a silver half dollar celebrating the Battle of Bennington and the independence of Vermont in 1925, the Chair noted the committee did not favor “legislation of this class, because of the great number of bills introduced to commemorate events of local and not national interest.”1 Anniversaries of local interest, however, continued to win commemorative stamps. 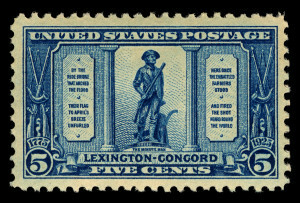 ¶ 6 Leave a comment on paragraph 6 0 Unlike other series, the Lexington and Concord commemoratives did not proceed chronologically by denomination. The 1-cent represented Washington assuming command of the Continental Army in Cambridge months after the initial skirmish. It was followed by a 2-cent depicting the actual confrontation, and the 5-cent completed the series memorializing the minuteman soldier.4. 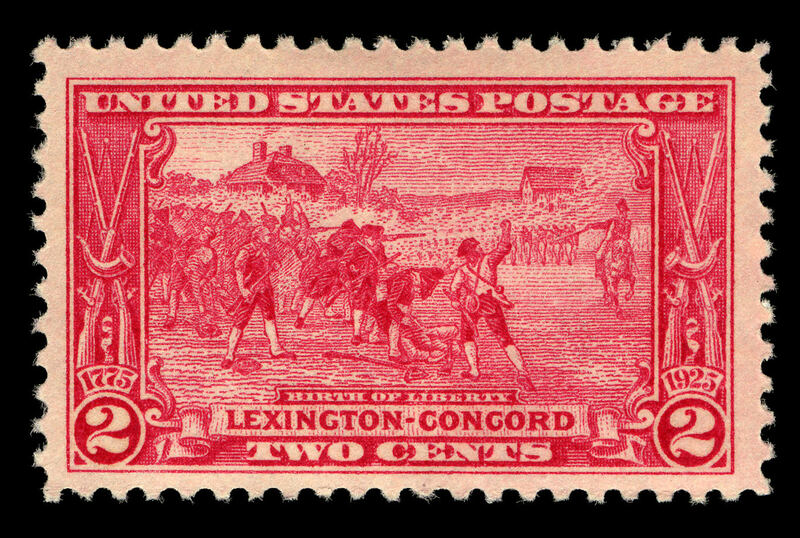 The image of Washington taking command of the continental army in Cambridge on the stamp was a conglomerate of nineteenth-century prints depicting this scene. 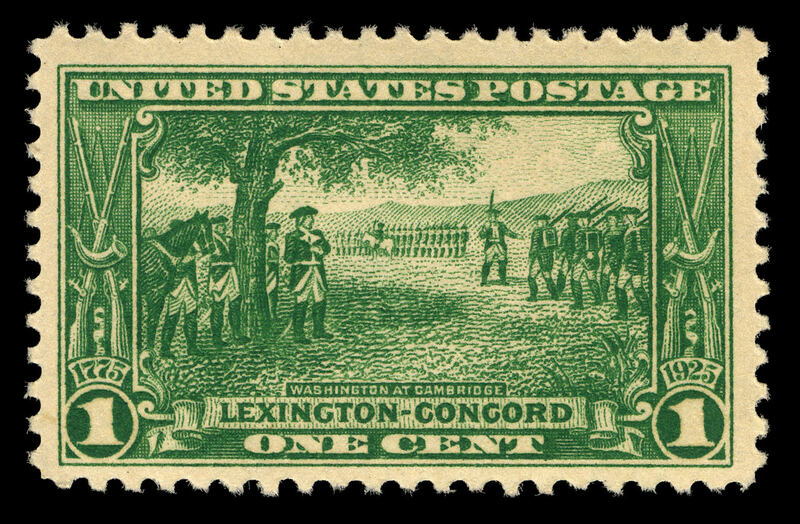 ¶ 10 Leave a comment on paragraph 10 0 Those prints, however, chose to represent Washington on horseback, while Washington stood among his soldiers on the stamp. This interpretation argues that Washington was a man equal to his soldiers, standing as a fellow citizen, even as he is set apart because he was not equal in rank or status. ¶ 12 Leave a comment on paragraph 12 0 Ready for war, the collected armies are dressed uniformly while one company marches in the right of the scene and another larger company stands at attention in the background. The viewer is led to believe that the Continental Army organized soon after the first confrontation and was prepared for combat. 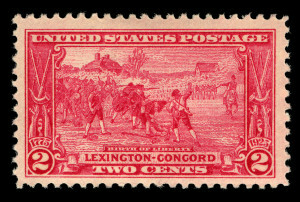 ¶ 13 Leave a comment on paragraph 13 0 Based on a painting by Henry Sandham, the 2-cent issue borrowed this victorious vision of the battle.5 The stamp mislabels the painting as “The Birth of Liberty,” while it is titled “The Dawn of Liberty.” Sandham painted the minutemen as a disadvantaged band of soldiers on foot who engaged the British in battle who charged on horseback. ¶ 15 Leave a comment on paragraph 15 0 The minutemen appear larger in size but smaller in number in the foreground, standing victoriously with their arms in the air, shaking fists at the enemy, who appear smaller in size and larger in number, to be retreating in the background. This painting contrasts drastically with the vision etched by contemporary artist, Amos Doolittle, in May 1775. ¶ 17 Leave a comment on paragraph 17 0 Doolittle represented the small band of minutemen in disarray after the first shot was fired as they scattered across the Lexington green in retreat. From other sources available, this representation seems to more accurately describe the events at Lexington. Other engravings by Doolittle show the British forces dominating, such as this view of Concord. ¶ 19 Leave a comment on paragraph 19 0 While the British eventually retreated to Boston after a standoff in Concord, the colonist did not defeat the British. Both sides exchanged fire and lost lives in this brief skirmish. Accuracy, however, was irrelevant to local history enthusiasts and residents who believed in the town’s centrality to the Revolution’s narrative as its birthplace. The Lexington Historical Society purchased Sandham’s painting in 1886 to hang in their town hall, and this scene was an integral part of their local history.6 Embedded in the residents’ memory was that their fictive ancestors were a victorious band of volunteer soldiers who held off the well-trained British and forced a retreat. This image of local importance circulated across the country and the world and confirmed what most schoolchildren learned as part of the War for Independence narrative. ¶ 21 Leave a comment on paragraph 21 0 French’s monument was similar in design to that of the common-soldier Civil War memorials erected in municipalities across the country in the late nineteenth century. Civil War memorials crafted as standing soldiers holding a rifle, not embattled, remembered those who fought and died in the 1860s and transformed into places for honoring all veterans. In the case of the “Minute Man,” though the physical statue stood in Massachusetts, once on a stamp, its representation became a national symbol of the earliest citizen soldiers who fought for independence. It was the stories of these men “who helped free our great and mighty country” represented on postage that collectors like Thomas Killride spoke of in his poem, “My Stamps.”8 Civil War monuments acted in ways to unify the country by focusing on the individuals who fought rather than the reasons for fighting. During the Revolutionary War, northern and southern colonies fought together, even if it was for a loosely-knit union. 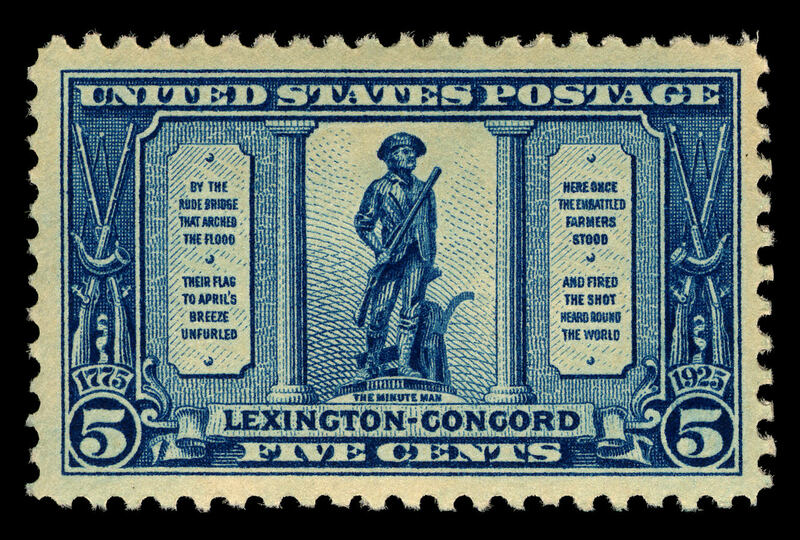 In 1925, the Massachusetts Minute Man acted as a unifying figure for celebrating white male citizenship throughout the U.S.
¶ 23 Leave a comment on paragraph 23 0 Consumers of the Minute Man commemorative saw in the stamp design that this figure was to be remembered as a heroic freedom fighter. 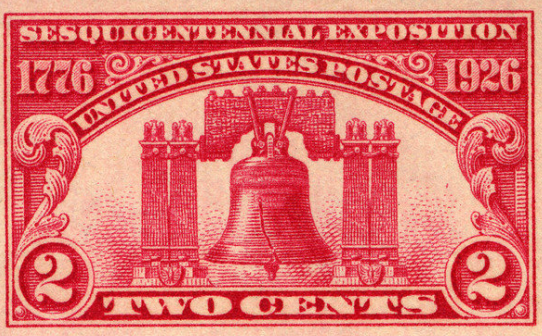 All commemorative stamps become miniature memorials once saved by collectors, but this particular stamp was designed to look like a memorial. The stamp represents the original sculpture and then frames it as if French’s piece was part of a large Neo-Classical memorial. Unlike the statue that stands in a field in Concord, the Minute Man on the stamp is flanked by two Doric order columns and two tablets bearing verses from Emerson’s hymn as if the verses are commandments, giving the statue the appearance of standing in an architectural niche. A niche highlights the figure inside it, and very often the figure is one to be worshipped or revered. Reverence of the Minute Man is reinforced with lighter shading behind the statue’s head on the stamp that draws the eye in to focus on an archetypal American hero. ¶ 24 Leave a comment on paragraph 24 0 Like physical memorials, commemoratives do not allow space for questioning of the subject’s interpretation. The Battle of White Plains and Vermont Sesquicentennial issues in 1926 and 1927 continued the theme of citizen soldiers as battle heroes. Unnamed, without military uniforms, men fought and represented the Green Mountain Boys in Vermont, for example, to defend their territory against British forces. In these stamps, and in the spirit of the commemorations, the white citizen-farmer-soldier stood as the archetypal American hero.